By default, all books’ Email Validation Log setting is set to “No. 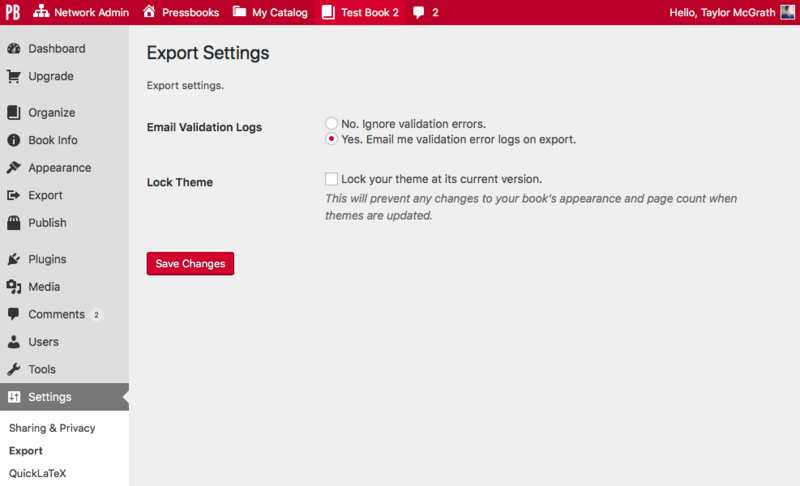 Ignore validation errors.” If you choose to receive validation logs (or error reports) from Pressbooks, all file validation error logs will be forwarded to the email address associated with your Pressbooks account. Each type of file is created with a different software, so each type of file will have a slightly different validation log. Read on to see how to interpret each type of validation log. Below is an example of what an error report may look like. ERROR(RSC-020): /srv/www/pressbooks.com/releases/20181205114740/web/app/uploads/sites/107381/pressbooks/exports/Test-Book-2-1544480239.epub/OEBPS/chapter-056-your-chapter.html(26,268): ‘http://bit.ly/btb-v092″>http://bit.ly/btb-v092′ is not a valid URL. ERROR(RSC-020): This code identifies what type of error has been caught. The code correlates to the description at the end of the entry log. chapter-035-your-chapter.html: This information tells you exactly where the problem is in your book. In this book, the chapter that contains the error is chapter 35, which has been titled “Your Chapter.” If you saved a chapter before giving it a title, this URL will have the randomly generated slug instead of the chapter’s title. (26,268): The last piece of data from this URL is the exact line and character the error occurs at in your EPUB file’s HTML. If knowing the chapter didn’t help you find the error and you need to pinpoint its exact location in the book, we suggest using the ebook management application Calibre to view your EPUB file. While in “edit” mode Calibre interface lets you see the exact line and character of the HTML for each chapter in your EPUB file. ‘http://bit.ly/btb-v042″>http://bit.ly/btb-v042’ is not a valid URL: This is an example of an RSC-020 error, which states that a URL in your book is not valid. The RSC code from the beginning of the error log entry will always correlate to the type of error you’re receiving; the information that comes after the error URL will always describe what the error is about. Below is an example of what a MOBI error report may look like. You’ll notice that the log still contains the standard metadata at the top of the message. You’ll then see a message acknowledging that MOBI is a proprietary ebook format copyrighted by Amazon. After, the MOBI log goes through each step that’s required to validate the MOBI file. In most cases, you should receive only Info(prcgen) notifications, which are the normal steps that a file has to pass. If something’s wrong, you’ll receive a Warning. Warnings will be followed by labels that describe what the warning applies too. As an example, the above validation log has htmlprocessor and prcgen errors. Next is the description of how to fix the error. In the above example, this displays as: “Please do not use: ‘counter-increment’ in file: /tmp/mobi-BxToYA/OEBPS/buckram.css”. This tells you that the error specifically was caused by the counter-increment property in the ebook CSS. Once you remove the counter-increment from the style sheet, the error will disappear. All warnings must be resolved before Amazon will accept the MOBI file for publication. PDF files tend to have fewer validation errors than ebook files. Because PDFs are static documents, meaning they always look the same for every device and user, they’re not as sensitive to errors and may export fine despite issues in your EPUB or MOBI files. However, errors still sometimes occur. Below is an example of what a PDF validation log may look like. The PDF validation log is straight forward; you’ll see the date stamps for the beginning, the flagged errors, the successful finish, and the end of the process. The only part you’ll need to look at is the error. Find an error by looking for the word “warning”. Each warning will begin with a timestamp. Afterward, you’ll see a description of the error. For the example above, on page 163, the PDF converter was unable to find a font in the file that supplied the emoticon character entered by the user. To solve an error like the one above, a user can find the page number from the error report, go to its chapter in Pressbooks, and remove the emoticon that caused the problem. Use the error report to figure out the type of error and its location in your PDF file. Below is an example of what a SASS error may look like. In the example above, the error in the CSS is an "unclosed block." The error log states that the block has failed on line 49. You can go into your CSS, find line 49, and modify the CSS to resolve the error. With this error, the user forgot to add a closing bracket "}" to their custom styles. After the user adds the closing bracket, the error will disappear in future exports.